You can tell by this kid's face that he has done something wrong. 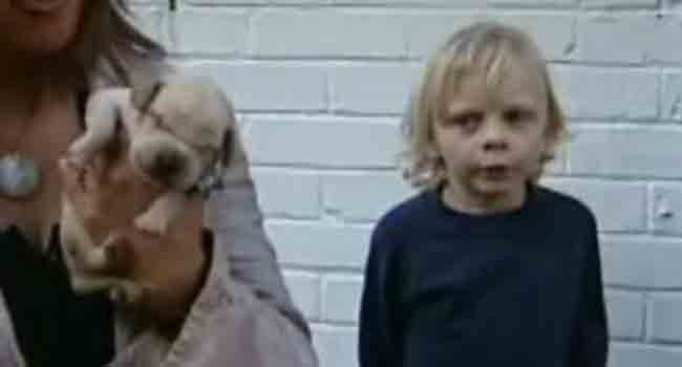 A little boy's love for his new puppy nearly cost the animal its life this week in England. Daniel Blair decided his new pet needed a bath and what better place to do that then in a toilet bowl? The four year old was going for a rinse when the one week old cocker spaniel was flushed right down the drain. Daniel's mom said she panicked when she heard what had happened. "As soon as Daniel told me what he'd done, I ran out of the house where the manhole was behind the toilet," said Alison Blair. Alison Blair said she lifted the manhole cover, hoping to find the puppy. She couldn't see him, but she could hear him. The flushed pup was stuck for hours. His ordeal was captured and posted on YouTube. Rescue crews didn't have the right equipment so they finally called in a plumber. A little camera designed to take a peek in sewage pipes not only found the stuck pup, it was also used to push him out the other end to the loving arms of a fireman. The tool is called a Dyno-rod. The once nameless puppy is now called Dyno in its honor. Although getting flushed down the toilet had to be dramatic, the little guy made it through the ordeal without a scratch, proving cats are not the only ones who have nine lives.